Dr. Richard Kimble, a prominent Chicago vascular surgeon, arrives home to find his wife Helen fatally wounded by a one-armed man. Kimble struggles with the killer but he escapes. The lack of evidence of a break-in, Helen's lucrative life insurance policy, and a misunderstood 9-1-1 call result in Kimble's conviction of first-degree murder and a subsequent death sentence. Being transported to death row by bus, his fellow prisoners attempt an escape. The pandemonium sends the bus down a ravine and into the path of an oncoming train. Kimble saves a guard, escapes the collision and flees. Deputy U.S. Marshal Samuel Gerard and his colleagues Renfro, Biggs, Newman and Poole arrive at the crash site and begin the search for Kimble. Kimble sneaks into a hospital to treat his wounds and alter his appearance. He eludes the authorities, but Gerard corners him at the edge of a storm drain over a dam. Kimble leaps into the raging water and escapes. Kimble returns to Chicago to hunt for the murderer and acquires money from his friend and colleague Dr. Charles Nichols. Posing as a janitor, Kimble enters the local county hospital's prosthetic department to obtain a list of people who had their prosthetic arm repaired shortly after his wife's murder. Following a police lead confirming Kimble's recent whereabouts, Gerard speculates that Kimble is searching for the one-armed man. Kimble breaks into the residence of one of the people on the list, a former police officer named Fredrick Sykes. Kimble discovers that Sykes is the murderer and is employed by a pharmaceutical company, Devlin MacGregor, which is scheduled to release a new drug called Provasic. Kimble investigated the drug in the past and revealed that it caused liver damage, which would have prevented it from being approved by the FDA. He also deduces that Nichols, who is leading the drug's development, arranged a cover-up and ordered Sykes to kill him; his wife was not the intended victim. Gerard follows Kimble's lead to Sykes' home and draws the same conclusion. As Kimble takes an elevated train to confront Nichols at the drug's presentation in a hotel, Sykes appears and attacks him. In the struggle, Sykes shoots a transit cop before being subdued and handcuffed to a pole by Kimble. Kimble arrives at the pharmacon conference and interrupts Nichols' speech, accusing him of falsifying his medical research and orchestrating his wife's murder. They fight while being chased through the hotel by the marshals and police. Gerard calls out to Kimble that he knows about Nichols' conspiracy. Nichols knocks out Renfro and takes his gun and attempts to shoot Gerard, but Kimble attacks him from behind, knocking him unconscious. Kimble surrenders to Gerard, who escorts him out of the hotel. Nichols and Sykes are arrested. Kimble is exonerated and driven from the crime scene by Gerard. 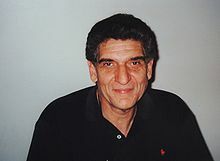 Andreas Katsulas portrayed Fredrick Sykes, also known as the "one-armed man". Harrison Ford was not originally cast for the role of Dr. Kimble. Instead, a number of actors were auditioned for the part, including Alec Baldwin, Nick Nolte, Kevin Costner, and Michael Douglas. Nolte in particular felt he was too old for the role despite only being a year older than Ford. Although the role of Gerard went to Tommy Lee Jones, Gene Hackman and Jon Voight were both considered for the role. The character of Dr. Nichols was recast for Jeroen Krabbé after the original actor who landed the role, Richard Jordan, fell ill with a brain tumor. Jordan subsequently died three weeks after the film's release. Filming locations for the motion picture included Cherokee, North Carolina; Tennessee; Chicago; and Dillsboro, North Carolina. Although almost half of the film is set in rural Illinois, a large portion of the principal filming was actually shot in Jackson County, North Carolina in the Great Smoky Mountains. The scene involving Kimble's prison transport bus and a freight train wreck was filmed along the Great Smoky Mountains Railroad just outside Dillsboro, North Carolina. Riders on the excursion railroad can still see the wreckage on the way out of the Dillsboro depot. The train crash cost $1 million to film. A real train was used for the filming, which was done in a single take. Scenes in the hospital after Kimble initially escapes were filmed at Harris Regional Hospital in Sylva, North Carolina. Cheoah Dam in Deals Gap was the location of the scene in which Kimble jumps from the dam. Deals Gap is also a popular and internationally famous destination for motorcycle and sports car enthusiasts, as it is located along a stretch of two-lane road known since 1981 as "The Dragon" or the "Tail of the Dragon". The rest of the film was shot in Chicago, Illinois, including some of the dam scenes, which were filmed in the remains of the Chicago freight tunnels. The character Sykes lived in the historic Pullman neighborhood of Chicago. Harrison Ford uses the pay phone in the Pullman Pub, and then climbs a ladder and runs down the roofline of the historic rowhouses. During the St. Patrick's Day Parade chase scene, Mayor Richard M. Daley and Illinois Attorney General Roland Burris are briefly shown as participants. James Newton Howard composed the film's musical score, which Janet Maslin of The New York Times called "hugely effective". Elektra Records released an album featuring selections from the score on August 31, 1993. La-La Land Records later released a 2-disc, expanded and remastered edition of the score, featuring over an hour of previously unreleased music, tracks from the original soundtrack, and alternate cues. The Fugitive received universal acclaim. Rotten Tomatoes rated a "Certified Fresh" 96% based on 74 critics averaging 7.9/10, stating: "Exhilarating and intense, this high-impact chase thriller is a model of taut and efficient formula filmmaking, and it features Harrison Ford at his frantic best." Metacritic averaging a score of 87 based on 32 reviews. Desson Howe, writing in The Washington Post, called the film "A juggernaut of exaggeration, momentum and thrills — without a single lapse of subtlety — "Fugitive" is pure energy, a perfect orchestration of heroism, villainy, suspense and comic relief. Ford makes the perfect rider for a project like this, with his hangdog-handsome everyman presence. He's one of us — but one of us at his personal best. It's great fun to ride along with him." Left impressed, Rita Kempley also writing in The Washington Post, surmised how the filmed contained "Beautifully matched adversaries" figuring, "One represents the law, the other justice — and it's the increasingly intimate relationship between them that provides the tension. Otherwise, 'The Fugitive' would be little more than one long chase scene, albeit a scorchingly paced and innovative one." In a mixed to positive review, Marc Savlov of The Austin Chronicle wrote that "Director Davis valiantly tries to keep the breakneck, harried pace of an actual flight going throughout, and only occasionally drops the ball (the film's convoluted conspiracy ending is the first example to beat me about the face and neck just now — others will crop up after deadline, I'm sure)." Of the lead actor's performance he said, "Ford may be the closest thing we have these days to a Gary Cooper, but really, where's David Janssen when we really need him?" Owen Gleiberman of Entertainment Weekly said that the film was about "two chases, two suspense plots running on parallel — and finally convergent — tracks. Kimble and Gerard spend the entire film on opposite sides of the law. Before long, though, we realize we're rooting for both of them; they're both protagonists, united in brains, dedication, superior gamesmanship. The film's breathless momentum springs from their jaunty competitive urgency." In a 2018 review for The Atlantic, Soraya Roberts says the film is "notable for being the best of a genre that no longer really exists: the character-driven Hollywood action movie for adults." The film, however, was not without its detractors. Geoff Andrew of Time Out viewed the film as "A glossy, formula chase movie with the requisite number of extravagant action sequences". The critic added, "Ford is up to par for the strenuous stuff, but falls short on the grief, anxiety and compassion, allowing Tommy Lee Jones to walk away with the show as the wisecracking marshal on Kimble's trail." In a formulaic fashion, columnist Ethan Ham writing for the Bright Lights Film Journal speculated that supporting actor Tommy Lee Jones' character was "much more disturbing than the inept police." Later explaining, "In Kimble's first encounter with Gerard, Kimble says, 'I didn't kill her!' Gerard responds, 'I don't care.'" In the Chicago Sun-Times, noted film critic Roger Ebert voiced his enthusiasm with the picture observing, "The device of the film is to keep Kimble only a few steps ahead of his pursuers. It is a dangerous strategy, and could lead to laughable close calls and near-misses, but Davis tells the story of the pursuit so clearly on the tactical level that we can always understand why Kimble is only so far ahead, and no further. As always, Davis uses locations not simply as the place where action occurs, but as part of the reason for the action." Rating the film with three stars, James Berardinelli of ReelViews professed, "Following the opening scenes, we're treated to over a half-hour of nonstop action as Gerard and his men track down Kimble. Directed and photographed with a flair, this part of the movie keeps viewers on the edges of their seats. Most importantly, when on the run, Kimble acts like an intelligent human being. Equally as refreshing, the lawmen are his match, not a bunch of uniformed dunces being run around in circles." Harrison Ford, bearded and numb with grief, breathes new life into the role last played by the stoic David Janssen some 26 years ago. Janssen played Kimble as the Lone Ranger with a stethoscope, moving from town to town, but Ford takes a darker, more gothic approach. For the most part, satisfied with the quality of the motion picture, Jonathan Rosenbaum of the Chicago Reader said that "The mystery itself is fairly routine, but Jones's offbeat and streamlined performance as a proudly diffident investigator helps one overlook the mechanical crosscutting and various implausibilities, and director Andrew Davis does a better-than-average job with the action sequences." Leonard Klady writing in Variety exclaimed, "This is one film that doesn't stint on thrills and knows how to use them. It has a sympathetic lead, a stunning antagonist, state-of-the-art special effects, top-of-the-line craftsmanship and a taut screenplay that breathes life into familiar territory." Film critic Chris Hicks of the Deseret News accounted for the fact that the film "has holes in its plotting that are easy to pick apart and characters that are pretty thin, bolstered by the performances of seasoned vets who know how to lend heft to their roles." But in summary he stated, "the film is so stylish, so funny and so heart-stopping in its suspense that the audience simply doesn't care about flaws." The Fugitive was also significant in that it was the first major American film to be screened in the People's Republic of China in decades, following restrictions on foreign films. The Fugitive opened strongly at the U.S. box office, grossing $23,758,855 in its first weekend and holding the top spot for six weeks. It eventually went on to gross an estimated $183,875,760 in the U.S., and $185,000,000 in foreign revenue for a worldwide total of $368,875,760. The film was nominated and won several awards in 1993–94. Various film critics included the film on their lists of the top 10 best films for that year; including Roger Ebert of the Chicago Sun-Times who named it the fourth best film of 1993. The film was released on VHS and DVD in the United States on March 26, 1997. A special edition widescreen DVD was released on June 5, 2001. In 2009 a repackaged variant was released. Special features on the DVD include behind-the-scenes documentaries, audio commentary by Tommy Lee Jones and director Andrew Davis, an introduction with the film's stars and creators, and the theatrical trailer. The film was released on Blu-ray on September 26, 2006. Special features include commentary by Tommy Lee Jones and director Andrew Davis, two documentaries, and the theatrical trailer. The audio and visual quality received negative reviews, with Blu-ray.com calling it "mostly abysmal". A 20th anniversary Blu-ray edition was released on September 3, 2013 with a new transfer, along with DTS-HD Master Audio tracking among other features. Jones returned as Gerard in a 1998 spin-off, U.S. Marshals. It also incorporates Gerard's team hunting an escaped fugitive, but does not involve Harrison Ford as Kimble or the events of the initial 1993 feature. Also in 1998, a parody film Wrongfully Accused, based on The Fugitive, was developed with Leslie Nielsen portraying the principal character. Although the film spoofs many other motion pictures such as Mission Impossible and Titanic, the storyline revolves around Nielsen's character being framed for a murder, as he escapes from federal custody to seek out the real suspect behind the crime. A short-lived TV series remake (CBS, October 6, 2000 – May 25, 2001) of the same name also aired, starring Tim Daly as Kimble, Mykelti Williamson as Gerard, and Stephen Lang as the one-armed man. It was filmed in various places, including Seattle, Washington. CBS canceled the series after one season, leaving a cliffhanger unresolved. Jeanne Kalogridis wrote a mass-market paperback novelization of the film. She worked from the original screenplay, which characterizes a doctor unjustly accused of a crime, while being pursued relentlessly by federal authorities. In 1995, the movie was remade in India as "Nir nayam" in regional language Malayalam. While the central theme of the movie remained the same ￼some details were altered to suit the local set up. ^ "The Fugitive". The Numbers. Retrieved 2012-12-23. ^ a b "The Fugitive (1993)". Box Office Mojo. Retrieved 2012-12-23. ^ a b "'The Fugitive': 25 Things You (Probably) Didn't Know About the Harrison Ford Movie". MovieFone. 2013-08-07. Archived from the original on 2013-08-08. Retrieved 2013-08-07. ^ "The Fugitive Production Details". Yahoo! Movies. Retrieved 2012-12-23. ^ "Great Smoky Mountain Railroad Frequently Asked Questions (2008 archive copy)". Web.archive.org. 2008-01-17. Archived from the original on January 17, 2008. Retrieved 2012-05-16. ^ The Fugitive (dvd). Chicago, Illinois: Warner Bros. 1993. Event occurs at 1:26:15. ^ The Fugitive (dvd). Chicago, Illinois: Warner Bros. 1993. Event occurs at 1:22:35. ^ Maslin, Janet (August 6, 1993). "The Fugitive (1993): Review/Film; Back on the Trail Of a One-Armed Man". The New York Times. Retrieved December 24, 2014. ^ "The Fugitive (2-CD Set): Limited Edition". La-La Land Records. Archived from the original on 2013-08-31. Retrieved October 21, 2012. ^ a b "The Fugitive". Retrieved 23 December 2012. ^ "The Fugitive (1993)". Rotten Tomatoes. Flixster. Retrieved 13 August 2016. ^ a b Ebert, Roger (6 August 1993). The Fugitive. Chicago Sun-Times. Retrieved 2012-12-23. ^ Howe, Desson (6 August 1993). 'The Fugitive' (PG-13). The Washington Post. Retrieved 2012-12-23. ^ a b Kempley, Rita (6 August 1993). 'The Fugitive' (PG-13). The Washington Post. Retrieved 2012-12-23. ^ Savlov, Marc (6 August 1993). The Fugitive. The Austin Chronicle. Retrieved 2012-12-23. ^ Gleiberman, Owen (1993). The Fugitive (1994). Entertainment Weekly. Retrieved 2012-12-23. ^ Roberts, Soraya (2018-08-06). "Hollywood Doesn't Make Movies Like 'The Fugitive' Anymore". The Atlantic. Retrieved 2018-08-06. ^ GA (1993). 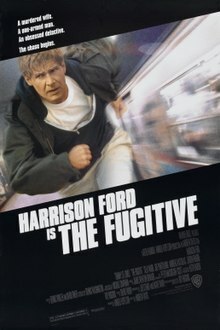 The Fugitive (1993) Archived 2012-11-07 at the Wayback Machine. Time Out. Retrieved 2012-12-23. ^ Ham, Ethan (1993). Marginalism in The Fugitive. Bright Lights Film Journal. Retrieved 2012-12-23. ^ Berardinelli, James (1993). Fugitive, The. ReelViews. Retrieved 2012-12-23. ^ Rosenbaum, Jonathan (August 1993). The Fugitive. Chicago Reader. Retrieved 2012-12-23. ^ Klady, Leonard (8 August 1993). The Fugitive. Variety. Retrieved 2012-12-23. ^ Hicks, Chris (5 July 2002). Film review: Fugitive, The. Deseret News. Retrieved 2012-12-23. ^ Ying Zhu; Stanley Rosen (1 June 2010). Art, Politics, and Commerce in Chinese Cinema. Hong Kong University Press. pp. 35–. ISBN 978-962-209-176-4. ^ "Weekend Box Office : 'Fugitive' Makes Off With $23.8 Million". Los Angeles Times. Retrieved 2011-01-11. ^ "Weekend Box Office September 17–19, 1993". boxofficemojo.com. Retrieved 2010-06-14. ^ "The Fugitive". The-Numbers.com. Retrieved 2009-07-13. ^ "Labor Day Weekend Box Office: 'The Fugitive' Just Keeps on Running". Los Angeles Times. Retrieved 2010-10-24. ^ "The Fugitive (1993): Awards & Nominations". MSN Movies. Retrieved 2013-01-02. ^ "The Best 10 Movies of 1993". RogerEbert.com. Retrieved 2013-01-02. ^ "The 66th Academy Awards (1994) Nominees and Winners". Oscars.org. Retrieved 2013-01-02. ^ "Nominees & Recipients". American Cinema Editors. Archived from the original on 2012-02-12. Retrieved 2013-01-02. ^ "The ASC Awards for Outstanding Achievement in Cinematography". American Society of Cinematographers. Archived from the original on 2010-11-12. Retrieved 2013-01-02. ^ "ASCAP Film & Television Music Awards". The American Society of Composers, Authors and Publishers. Retrieved 2013-01-02. ^ "Academy Prizes". Japan Academy Prize Association. Retrieved 2013-01-02. ^ "Awards Database". Bafta.org. Retrieved 2013-01-02. ^ "Chicago Film Critics Awards - 1988-97". Chicago Film Critics Association. Retrieved 2013-01-02. ^ "Awards". Cinema Audio Society. Archived from the original on 2014-02-23. Retrieved 2013-01-02. ^ "1993 Winners and Nominees". Directors Guild of America. Retrieved 2013-01-02. ^ "Edgar Database". TheEdgars.com. Retrieved 2013-01-02. ^ "The 51st Annual Golden Globe Awards (1994)". Golden Globes. Archived from the original on 2013-07-03. Retrieved 2013-01-02. ^ "KCFCC Award Winners 1990-1999". Kansas City Film Critics Circle. Retrieved 2013-01-02. ^ "Previous Years Winners 1993". Los Angeles Film Critics Association. Retrieved 2013-01-02. ^ "1994 MTV Movie Awards". MTV. Retrieved 2013-01-02. ^ "Past Awards". National Society of Film Critics. Archived from the original on 2011-01-11. Retrieved 2013-01-02. ^ "Awards 1993". Southeastern Film Critics Association. Archived from the original on 2012-07-17. Retrieved 2013-01-02. ^ "Awards Winners". Writer Guild Awards. Archived from the original on 2010-10-22. Retrieved 2013-01-02. ^ "AFI's 100 YEARS...100 THRILLS". American Film Institute. Retrieved 2013-01-02. ^ "The Fugitive (1993) - DVD Widescreen". Barnes & Noble. Retrieved 2012-12-23. ^ "The Fugitive All Available Formats & Editions". Barnes & Noble. Retrieved 2013-01-28. ^ "The Fugitive (Wide Screen/Repackaged)". Barnes & Noble. Retrieved 2012-12-23. ^ "The Fugitive Blu-Ray". Barnes & Noble. Retrieved 2012-12-23. ^ "The Fugitive: 20th Anniversary Edition (Blu-ray)". DVD Talk. Retrieved 2014-09-24. ^ "U.S. Marshals (1998)". Hollywood.com. Retrieved 2013-01-02. ^ "Wrongfully Accused (1998)". AllMovie. Retrieved 2014-04-18. ^ Dillard, J.M. (1993). The Fugitive. Island Books. ISBN 978-0-440-21743-5. Deane, Bill (2006). Following the Fugitive: An Episode Guide And Handbook to the 1960s Television Series. McFarland & Company. ISBN 978-0-786-42631-7. Abaygo, Kenn (1997). Advanced Fugitive: Running, Hiding, Surviving And Thriving Forever. Paladin Press. ISBN 978-0-873-64933-9. Janssen, Ellie (1997). My Fugitive. Lifetime Books Inc. ISBN 978-0-811-90857-3. Bernstein, Arnie (1998). Hollywood on Lake Michigan: 100 Years of Chicago & the Movies. Lake Claremont Press. ISBN 978-0-964-24262-3. This page was last edited on 20 April 2019, at 05:02 (UTC).